Getting there : By air: The nearest airport is Jaipur (175 km), which has very well air link with all major locations of the country. By rail: Sawai Madhopur (11 km) is the nearest railhead. 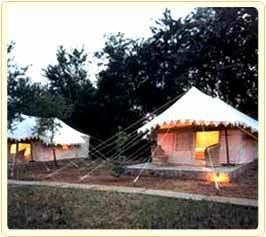 Accommodation : 12 luxury tents, each having spacious bedroom, veranda and toilet attached in it. Facilities/services : Telephone, television, Internet, fax, currency exchange, credit card (Visa, Master, Maestro) acceptance, laundry service, clock room, room service, car rental. Highlights : The excellent tent accommodation of the resort helps guests forming the intimate bond with nature. The resort, moreover takes care of all arrangement of wildlife sightseeing in the Ranthambore National Park and other recreational activities. Lying close to the boundary of Ranthambore National Park, Sher Bagh Resort Hotel is mostly dwelled by guests willing to venture the best possible interaction with nature. The resort with its great endeavour to establish ecological balance between human and nature let guest enjoy an vacation with a difference. Sher Bagh Hotel lies close to the boundary of Ranthambore National Park, and the main entrance of the park can be reached in just 10 minutes from the resort. Easy accessibility of Ranthambore to all other part of country give it one of many reasons to be hankered by Eco tourists. The resort / park has got very well established rail, air and road route from major spots like Delhi and Jaipur. Jaipur (175 km) is the nearest airport that has got very good air link with all other major airports of country. Sawai Madhopur (11 km) is the nearest railway station, where many of express trains pases through and connects it to major cities like Delhi and Mumbai. The beautiful wildlife forest hotel, Sher Bagh Resort, built by Maharajah of Jodhpur in early 20th century is furnished with excellent accommodation facilities. The resort have 12 luxury tents, each having spacious bedroom, veranda and toilet attached in it. Every tents are well decorated and have king size beds and comfortable furniture. Each of the tents are given all kind of general facilities like telephone, television, Internet, fax, currency exchange, credit card (visa, master, maestro) acceptance, laundry service, clock room, room service and car rental. The forest hotel restaurant of Sher Bagh Resort has multi-cuisine restaurant which serves foods including Indian and International cuisine. Even the restaurant provides guests the facilities of 24-hr in-room dining. The bar of the restaurant has good stock of liquor including domestic and international range of wine, vodka and whiskey. The spa of the resort, Pugmark, offers guests ayurvedic messages and treatment facilities. The forest hotel tries their best to let guests have best possible wildlife excursion at Ranthambore National Park. The company of wildlife tour guide provided by the resort come to great help while enjoying game viewing, as they give guests all small information about the park and its inhabitants. Along with exploring the national park, our tour guide will accompany you discovering you the historical fort of Ranthambore, which is inside the park. Sher Bagh Resort arranges visit to Pali Ghat, a popular spot near Ranthambore, where guests can boat and have picnic excursion on the shore of river Chambal. 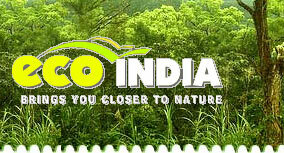 Besides, the resort also arranges visit to many field projects like dairy development, afforestation and Medicare.